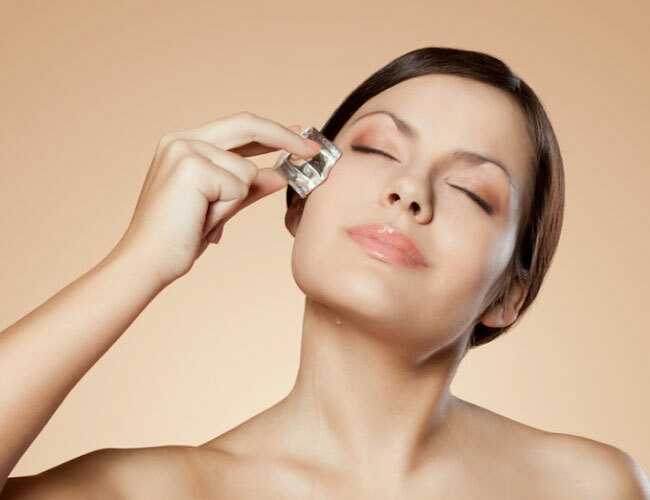 Ice cubes are extremely effective in enhancing the beauty of your skin. The cooling effect of ice can benefit your skin in ways more than one. Here are a few tricks to use ice cubes to enhance your beauty. Ice cubes help in soothing the skin of the face, thereby making it glow. Freeze some fruit with the ice cubes and see the effect on your skin. They reduce the redness and acne. Wrap an ice cube in a Ziploc bag and dab it on the acne affected area. This will reduce the redness as well as the pain. They increase the blood flow and reduce wrinkles. They help reduce puffy eyes. This is very helpful when you haven't slept well and want to look fresh for the next day at work. Also, if you have heavy puffiness under your eyes, you should brew some black tea and freeze it into ice cubes and rub it over your eyes. If you also have dark circles, freeze cucumber with ice cubes and rub it around your eyes. Ice cubes reduce the effects of tan as well. It is a great home remedy to get rid of skin darkening due to tan. It soothes the burning effects of sun burn. It helps control the excess face oil. Rubbing ice cubes on the face tightens the pores temporarily and keeps sebum, which is responsible for oil secretion, in check. This helps keep your face fresh and less oily. Rub ice cubes on your face before applying makeup and it will make it last longer. Which Bollywood celebrities have good phone etiquettes? What Does Tattoo Mean To A Person?